↑ Housden, Martyn (১৯৯৭)। Resistance and Conformity in the Third Reich। New York: Routledge। আইএসবিএন 0-415-12134-5। page 100: "He was endorsing both the tyrannical occupation of Poland and the use of its people as slave labourers"
Hoffman, Peter (1995). Stauffenberg : A Family History, 1905–1944. McGill-Queen's University Press. আইএসবিএন ৯৭৮-০-৭৭৩৫-৩৫৪৪-২. Translation of the German-language original, Claus Schenk Graf von Stauffenberg und seine Brüder. Wheeler-Bennett, John; Overly, Richard (1968). The Nemesis of Power: German Army in Politics, 1918–1945. New York: Palgrave Macmillan Publishing Company (New Impression edition). আইএসবিএন ০-৩৩৩-০৬৮৬৪-৫. (জার্মান) Hoffmann, Peter (1998). Stauffenberg und der 20. Juli 1944. München: C.H.Beck. আইএসবিএন ৩-৪০৬-৪৩৩০২-২. Burleigh, Michael (2000). The Third Reich: A New History. Macmillan. আইএসবিএন ০-৩৩৩-৬৪৪৮৭-৫. Stig Dalager, Zwei Tage im Juli, documentary novel dealing with the 20th of July. Aufbau Taschenbuch-Verlag 2006. Claus Von Stauffenberg, the 20 July plot, and its aftermath are the subject of Paul West's novel The Very Rich Hours of Count von Stauffenberg, New York: Harper & Row, 1980, First Edition. (আইএসবিএন ০০৬০১৪৫৯৩৫). Von Stauffenberg and other participants in the 20 July uprising are seen planning and executing the assassination attempt in Ethan Mordden's novel The Jewcatcher, published in 2008. 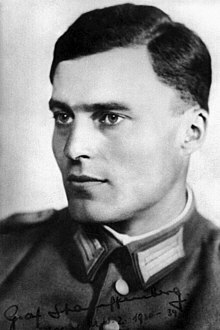 Claus Von Stauffenberg featured as a character in Justin Cartwright's 2007 novel, The Song Before It Is Sung. Herman Wouk: War and Remembrance chronicles the attempted assassination of Hitler and von Stauffenberg's subsequent execution in his epic novel, which was also made into a television mini-series. Christopher Ailsby: The Third Reich: Day by Day. Alexander Stahlberg: Bounden Duty: The Memoirs of a German Office 1932-45 notes conversations between Stauffenberg and Fieldmarshall von Manstein.